Lesion locations (most affected side, if known), number: Lesions vary in size and shape and allocated for the most part peripherally. Also, diffuse areas of T2 hypersensitivity in both cerebral hemispheres. There were no T1 hypertense lesions in 06/20/2010. MS treatments: Steroids, Cytoxan, Betaseron, and currently taking Capaxone. MS symptoms before stenosis intervention: Primarily cognitive, visual, hearing, fatigue, and increased rate of infections. Diagnosis: Fufilled 3 out of 5 parameters, therefore positive for CCSVI. Type of procedure: Jugular venous ultrasound, Angioplasty Jugulars (R) and Stents (L). Impact on your MS symptoms in words (01/25/2011): I am spontaneously wakeful in the morning, my memory is better, have greater energy, can hear music as more than just noise, seeing more clearly and with greater color perception, and better cold tolerance. Last edited by Cece on Mon Mar 21, 2011 1:32 pm, edited 1 time in total. Date & type of neurological diagnosis: SPMS and I may have had it since pre-teen. Don't recall ever having a relapse. Diagnosed Feb 2008. Lesion locations, number: Many, spine and brain, both sides. MS treatments: Never took DMDs. Take 4-AP, wheat-free/dairy-free diet, 5000 Vit. D3, Fish oil, etc. MS symptoms before stenosis intervention: fatigue, loss of balance, occasional vertigo, word-finding, bladder & bowel, MS hug, insomnia, anxiety, irritability, spasticity in legs (sometimes painful), leg spasms at night, trouble waking in morning, foot drop, weak grip, heavy legs. EDSS before CCSVI intervention (self-assessed): 6.0 in the morning, 3.5 in the afternoon. I started using a cane every morning and in crowds in February 2010, but rarely ever in the afternoon or evening. MRV: severe stenosis of lower left jugular, stenosis of lower and upper right jugular, azygous appears to have non-uniform shape. NOTES: Azygous was unclear in MRV due to movement. Blood flow analysis didn't work because synchronization to pulse was off. Doppler: normal flow on right side, turbulence and flutter on the left side. Procedure/drug related symptoms: Exhaustion from procedure/travel took days to get over. Mild soreness, especially in azygous. (02/25/2011) Balance and mood have been the most dramatic improvements. I feel great in the morning. I don't use a cane anymore ever. Sleeping through the night. Leg spasms are gone. Bladder did not improve. Tried to go off 4-AP for a few days, but fatigue was awful so I went back on a half dose and feel great again. (03/09/2011) Balance improvements lasted only 2 weeks. Zamboni-protocol ultrasound of jugulars shows no restenosis. (5/15/2011) 3 months after treatment, I'm still not using my cane. I sleep better than I have in my life and I dream! Leg spasms are much better and never wake me up anymore. Still get fatigued. Mood is dramatically better. (7/11/2011) 5 months after treatment. Still sleeping well, realized severe motion sickness I've had my whole life has been gone since the procedure. Back on full dose of 4-AP. Fatigue and balance are pretty bad. (8/1/2011) I had to start using a cane again, in the mornings and in crowds. (9/30/2011) Sleep has deteriorated. Mornings are back to pre-procedure levels: extremely stiff legs, hanging onto furniture and walls. Balance and fatigue are back to pre-procedure levels. Not remembering dreams anymore. Motion sickness is still gone. Mood is still better. Another Zamboni-protocol ultrasound of jugulars shows no restenosis. I'm going to get a CAT scan next. (8/10/2012) After CAT scan, tried upper cervical chiropractic at CCSVI doctor's suggestion. No improvements; probably still progressing. The fact remains: I used a cane for one year, and after venoplasty I didn't use a cane again for 5 months. Good luck to all! Last edited by KSA on Thu Nov 01, 2012 1:33 pm, edited 14 times in total. MS treatments: Diet only. Tried LDN but made me worse. MS symptoms before stenosis intervention: bladder urgency and frequency. Able to walk only 5 mins or on good day 10 mins. Balance worse in 2010. Diagnosis: Reflux on right and left jugular and faulty valve. Type of procedure: angioplasty of both jugulars and also azygous veins. Balloon only no stents. Procedure/drug related symptoms: Painful during procedure when ballons were inflated. Impact on your MS symptoms in words : No change in my symptoms. May be this was due to the relapse I suffered as a result of food poisoning, I don't know. Last edited by bigfoot14 on Wed Mar 16, 2011 9:24 am, edited 1 time in total. Impact on your MS symptoms in words (include date in brackets if there have been multiple updates): April 4th - Reduction in left side back pain after 15 years. Less numbness in feet and legs. No longer feel like walking on balls. Feet not cold. May 4th - Continue with same improvements that were initially noticed. June 4th - Continues with same improvements that were initially noticed. July 4th - Continues with same improvements that were initially achieved from procedure. Nov 30th - Continues with same improvements. Limited ability to walk hasn't improved but has not gotten worse. In Sept started Gilenya instead of Tysabri. Main difference when Tysabri was discontinued was fatigue increased and decreased when Gilenya started. No changes (positive or negative) noticed in improvements received from CCSVI procedure when Tysabri stopped or Gilenya started. Last edited by MaggieMae on Wed Nov 30, 2011 1:16 am, edited 7 times in total. MS symptoms before stenosis intervention: Walking issues primarily, staggering gait, spasticity in both legs, spasms, weakness. Tinnitus. Bladder urgency. Cog fog. Fatigue. Number of relapses before intervention: 3. First in 1995 (numb arm), second in 2001 (optic nuritis dx RRMS), third and last (and worst, affecting legs) in 2006. dx SPMS in 2009. 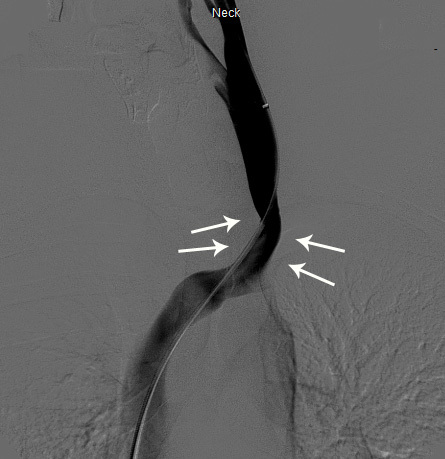 Entire left jugular vein appears significantly narrow and severely stenosed in the mid segment measuring 0.42mm in the supine and erect position with evidence of reflux. The valve appears malformed. The right internal jugular demonsrtates normal retrograde flow. No evidence of reflux, however the valve appears malformed. Appearances are consitent with CCSVI. Type of procedure: Doppler ultrasound scan. It's been 4 months since I had the procedure in Edinburgh, the surgeon found that the Azygos had some narrowing and this was ballooned. The Right IJV, whilst showing no sign of stenosis via Doppler, did show some narrowing during the procedure - this also was ballooned. The Left IJV was, as the doppler showed, extremely stenosed, so much so that the surgeon was unable to insert a catheter! Subsequently, this vein remains stenosed. I appreciated the cautious approach by the surgeon who did not want to risk rupturing the vein by trying too hard. He did explain that I ought not be too disappointed as he felt that a few issues were corrected and I should see some improvements. My improvements, which have held, are much less fatigue, much less cog fog/much more mental energy ( I am now able to happily hold conversations for a few hours without the need to isolate myself/ sleep after 10 minutes, due to fatigue). My feet are no longer blue and ice cold, but pink and warm. They are still a little numb however. My walking has not improved and I remain reliant on the use of a crutch indoors and a wheelchair outdoors. Balance is still terrible. I wonder what effects a successful venoplasty of my left IJV would bring and whether anyone else has had such a narrow vein that the intervention could not be performed. I think the only option available would be a vein graft, but at this time I think the risk outweighs the (potential) benefits. 6 month follow up not long away and I'll post an update following. Last edited by ajpickers on Fri Jul 29, 2011 2:33 pm, edited 2 times in total. Number of relapses before intervention (if applicable): Really don't have relapses, just a steady decline. March procedure produced: Just feel good inside, no outward results as of yet. Boyfriend dx'd 6-6-06!!! RRMS............CCSVI procedure done on Nov. 13, 2010 and March 7, 2011 by Dr. Sclafani! Lesion locations (most affected side, if known), number: several lesions on brain and alot on spinal cord. MS treatments: Copaxone on and off since 1998. Tried Avonex but bad flu symptoms Prednisone 4 times a year from 2003 til 2009. Progressive Weakness & painful thigh spasticity in right leg: couldn't lift left leg off the floor; poor balance; gait problems: Began using cane 2007 and now using 2 canes most of the time. coldness in both feet and turn purple when seated for more than 10 minutes. cog-fog, bladder urgency and worsening leakage fatigue; severe heat intolerance. Number of relapses before intervention (if applicable): mostly just steady worsening. EDSS before CCSVI intervention (self-assessed or physician-assessed? ): 6.5.I use a cane at all times. Are you using Inclined Bed Therapy I.B.T? (Y/N): N but feel good if I recline in recliner during day for an hour or so. mid level RIJV was balooned and Azygos balooned. Had huge web of collaterols off Azygos that disappeared as soon as balooned. I had had 2 compression fractures in my back in 2006 and 2009. 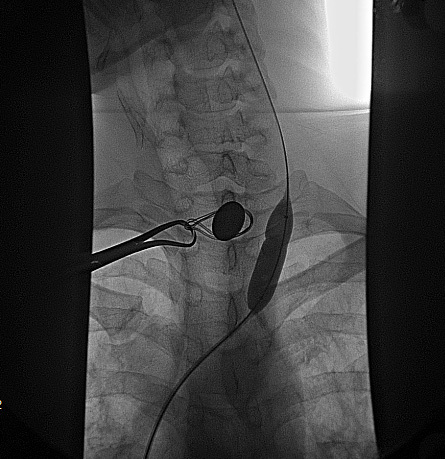 Prior to azygos ballooning, significant reflux of blood into spinal fluid. Wonder if this accounts for the large number of lesions on my spinal cord? Always had an internal warmth (blood flow?) in the area where the collaterols were. No (neuro) docs could explain this. Procedure/drug related symptoms: no problems. sore in chest where azygos ballooned. Positive: Initially I felt great: less fatigue, better cognition, left leg lifted and right leg felt stronger. Had a few episodes walking without a cane This only lasted 1-2 weeks. big incontinence 'events'. Tight, painful spasticity in right thigh worse. (read on..there's good news after procedure 2). low level RIJV and high level LIJV were balooned. Two areas (mid RIJV and Azygos did NOT restenose from 1st agioplasty!). The lower RIJV was now 70-80% stenosed. This was not there the first time I had the angioplasty at the mid RIJV. It seems that while the mid level stayed open, the lower level was now severely closed AND there was significant REFLUX). The high LIJV was balooned this time and doc said it was 50% stenosed and was just not treated the first time. Procedure/drug related symptoms: Spent several days in bed after this time cause felt wiped out. sore in neck. Number of relapses since first CCSVI intervention: some decline again. Negative: Didn't feel great initially. Stayed in bed for several days. My right leg is now not as strong and flexible (left RIJV balooned?). This is a big disappointment since the right leg was my friend. My hypothesis is that if you have a strong leg, you should try to avoid ballooning the opposite juggular. Fatigue isn't great but don't don't need to nap everyday. Gait is still not good and feel more steady using the 2 canes. Positive: NO INCONTINENCE - not once! no urgency even! not even leakage, NO PAINFUL RIGHT THIGH SPASTICITY - I've cut the Baclofen in half and no pain/tightness at all. COGNITION significantly better now too. I've been quizing myself on short term memory everyday and I'm much sharper in recall and conversation train of thought! Would love to walk better but my bladder,cognition, and spasticity improvements are PRICELESS! Date/location of testing/procedure: 04/12/11/VAC, Tukwila, Wa. Impact on your MS symptoms in words: 5 days post: energy, fatigue, balance, tinnitus, and sinusitis have improved.. dizziness, weakness/numbing unchanged..
Procedure/drug related symptoms: complications: fever and severe headache 24-48 hours post-op; swollen lymph node, swelling/tenderness on right side of neck 72 hours post-op. Left msg for doctor. Vertigo, fatigue, brainfog, intense headaches, feet numbness, heat intolerance, tinnitus, restless leg syndrome, Lhermitte's sign. Diagnosis: Doppler (Fulfill 3 criterias of Zamboni protocol), MRV (indication of left jugular vein stenosis), Venography (70% stenosis of left jugular vein). Was given no drugs after procedure. Slight pain at entry for venography (groin), Slight pain at point of angioplasty (left jugular stenosis balloon inflation) for about 1 month. Immediate positive impact on fatigue, brainfog and restless leg syndrome symptoms. Better sleep. No signs of vertigo or headaches anymore as well as left ear tinnitus. Numbness on feet remains as well as right ear tinnitus. Boosted energy levels. Fatigue, brainfog, headaches and restless leg syndrome symptoms still non-existant. Daily life near normal. Sports activities near normal. Numbness on feet remains as well as right ear tinnitus. Heat tolerance excellent. Energy levels still very high. Very active and low Fatigue, Slight Heat intolerance impact on numbness and Lhermitte's sign. Brainfog symptoms are starting to creep in again. Slight restless leg syndrome. Last edited by stathis on Wed Mar 20, 2013 3:45 am, edited 1 time in total. an action brings..... a reaction ! Lesion locations: Several visible MRI Plaques, no neck or chest plaques. Occasional numbness in both my arms, in the bottom part of my left leg and my right cheek. Number of relapses before intervention: 2 relapses. Severe inflammation on both arms (tendonitis), optic neuritis in left eye. Doppler ultrasound showed stenosis in the left and right jugular. The biggest problem appeared on the left. Possible reflux in the azygos vein. Conclusion: More than two criteria of Zamboni protocol fulfilled. 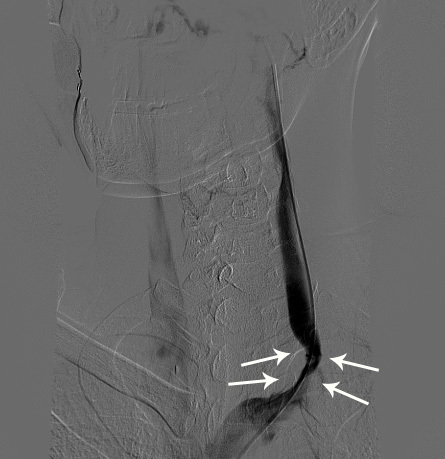 Venography study showed severe stenosis in the azygos vein. One stenosis in the left jugular and two on the right jugular vein. Type of procedure: Balloon Angioplasty in Azygos and Jugular Veins using special distending catheters (balloon) 10x40 mm. Procedure related symptoms: None (0). Post procedure therapy: Salospir 100mg, once a day for 3 months. Number of relapses since first CCSVI intervention: None (0). 1 week after procedure: Can’t tell a difference, my limbs still feel cold. 2 weeks after procedure: My Fatigue has greatly reduced. Feel more capable and energetic during the day. 1 month after procedure: Fatigue levels still decreasing. My memory skills have greatly improved. 2 months after procedure: Fatigue non-existent. My hands aren't so cold anymore. Can you help with Trinity College Dublin’s research project?